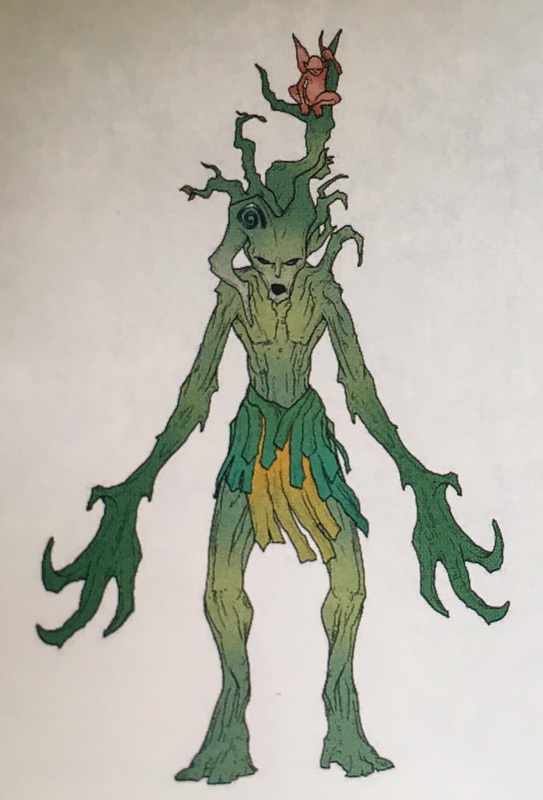 Here we have a WIP of the Dryads. So far I have completed the base coats I’ll be applying with the airbrush. 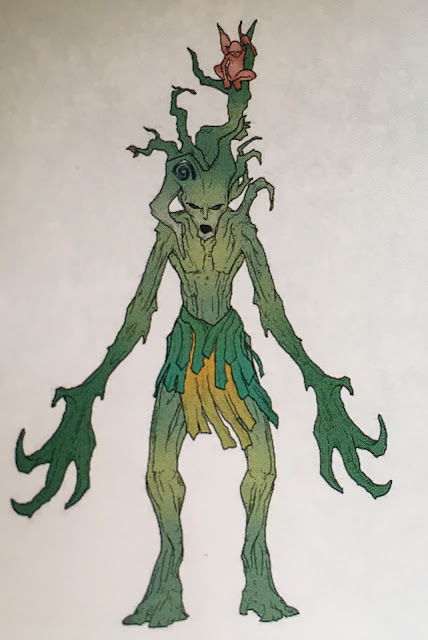 As I mentioned in a previous post, I’ll be following the colour scheme of the Harvestboon clan; as you can see below from one of the example colour schemes which the Dryads of Harvestboon follow, I’ve gone for a pale brown fading into green at the extremities of each model. The models have been undercoat with black Vallejo primer with was then followed up with grey Vallejo primer, applied from a zenith perspective (e.g. from above). Next, I painted the brown bark . This was achieved by airbrushing Baneblade Brown onto the model and then gradually highlighting the with Ushabti Bone and then Screaming Skull. It’s worth pointing out that I’ll be applying the shade as the last step of painting these models so at this point I am deliberately aiming to paint the models to a degree lighter than they will finally be. Once the bark had dried I moved on to the green. This was once again airbrushed on in order to achieve natural transitions. First of all I applied a 1-1 mix of Caliban Green and Ushabti Bone. Then I slowly added more Caliban Green and applied these shades closer to the end of the areas being painted green. Finally I turned my attention to the bases. Dryad Bark was first airbrush all over the base and then subtly highlighted with Gorthor Brown & Baneblade Brown. As these steps concluded the airbrushing of the base coats, I sealed the paint onto the models with a couple of coats of Vallejo matte varnish. Next up I will pick out the remaining base colours, apply highlights to those areas, apply gloss varnish and then finally shade the model down. After that I will have some fun with the bases! 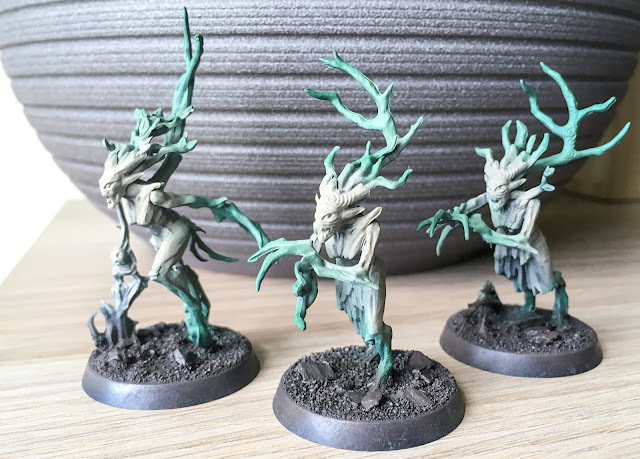 This week I’ve started working on my Sylvaneth in the form of the 16 Dryads which came as part of the start collecting box which I picked up back in February. I’ve been itching to start this project as it will involve a very different painting style compared to Space Marines. It will, therefore, require different skills and provide a new set of experiences. In particular, I’m really looking forward to testing out my fine detail airbrush game! After reading the Sylvaneth Battle Tome I found myself to have an affinity with the Harvestboon glade. 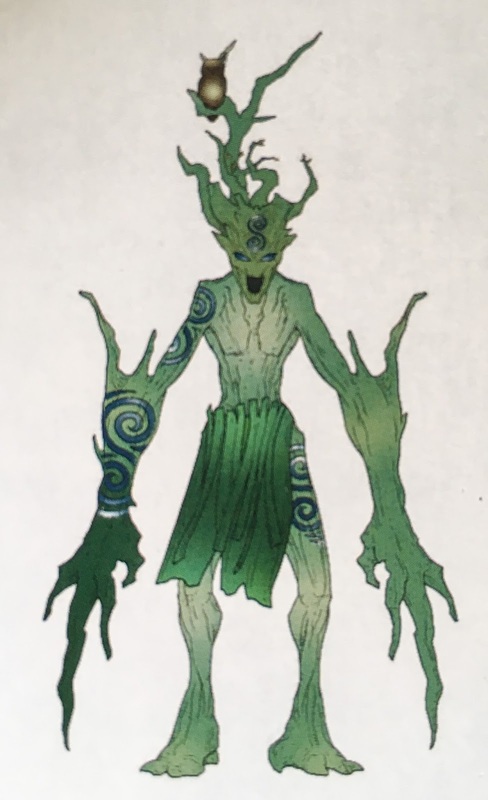 They are a youthful clan, not as ‘regal’ or ‘twisted’ as some other clans and they fit with the spring seasonal theme I want to base my models with. The Harvestboon colours mainly focus on greens with a more sombre accent of softer tones... but also with some bright yellow/green foliage. I plan to add a fair amount of detail to the bases of my models. I have a pack of Daffodil tufts as well as ‘Spring’ leaves. Whilst I haven’t tested any of these materials out yet, my aim is to sparingly use a combination of these two materials alongside some static grass over a brown texture base. 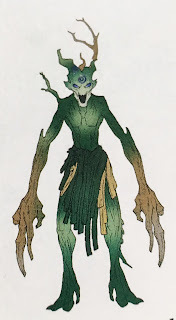 I’ll follow this post up with a WIP of the Dryads as soon as I can. After the success of BatchCon 2017, I wanted to make a post about the plan for next years event. So, planning is now firmly underway for next years day of wargaming goodness! BathCon 2017 focused largely (well, entirely!) on the sci-fi side of gaming with X-Wing, Shadow War: Armageddon and Warhammer 40,000 being what we played, next years event will take a more fantasy-focused theme. Blood Bowl, Gorechosen, ShadeSpire and Age of Sigmar will be systems we focus on. Both I and my long-term hobby boyfriend (known as Bob) are going to focus on Age of Sigmar armies over the coming months. We will be visiting Warhammer World for a weekend of gaming at the end of April. This will be split between 40k and AoS so we need to get some armies built and painted! I will be working to paint up 1000 points of Sylvaneth whilst Bob will be working on the same point value of Khorne Bloodbound. Obviously, the benefit of this is that, for BathCon 2018, we will have 2 suitable armies to game with. I also have a small force of Stormcast Eternals and Nurgle Daemons whereas Bob has Khorne and Nurgle Daemons as well… so there will be plenty for us to use! We also will likely dabble in some Blood Bowl seeing as I have fully painted Orc and Human teams and one of this year's guest has metal Skaven and High Elf teams which I’m sure he’ll look forward to dusting off. Blood Bowl can take a long time to play so I suspect we will limit the time dedicated to this game to one-half of a match. Alongside these games, Bob has picked up Gorechosen and this would be a perfect event to roll out the 4 player game of blood, guts and decapitations! Bob is also pondering picking up Warhammer Quest Silver Tower so that may also find its way onto the order of play! Finally, there’s ShadeSpire. At the time of writing, this is an unreleased game but both Bob and I will be picking it upon release. One last thing to mention… Some of these games will require a suitable board to play on! Having spent the last 7-8 months preparing a good 40k board, it looks like 2018 will see my focus shift on to preparing a fantasy style board. More on this soon! Hot on the heels of BathCon 2017, I've been working on Sly Marbo. This is an old GW model which I wanted to add to my collection due to his rules as a 'one man army' in Shadow War: Armageddon. I picked him, minus 1 arm and thickly coated in a rather terrible paint job from eBay for about£5! The arm was replaced with one from the Catachan set (again, an eBay purchase). My friend Dan used him (whilst still unpainted) with spectacular results during BathCon 2017. I will be starting to work on my Sylvaneth and Blood Angels models in preparation for a trip to Warhammer World in April 2018 but I wanted to get this guy painted up before starting those larger projects. For this model, I used tested out a new process- this involved painting his base coat and highlights before shading. I really enjoyed this process; it was quick and will certainly be the process I now follow for all future models. I base coated him with Bugmans Glow for the skin, Death World Forest for his vest, Caliban Green for his trousers and Dryad Bark for the pouches. Alongside those main colours, I painted the base with a mix of Mechanicus Standard Grey/Dryad Bark and Screaming Skull for the copper pipes. As this guy is a 'one man army' in the context of how I will use him, I wanted to add a more detailed base. The base used here was taken from the Warhammer 40K basing kit which was glued to the top of a 25mm base. Each colour was then highlighted using the recommended colours from the Citadel Painting System chart. Once complete the whole model was coated in gloss varnish in preparation for the wash. The final steps involved shading the model using a mix of Nuln Oil/Reikland Fleshshade/Lahmain Medium. After that was dry I added Nihilakh Oxide/Nurgle's Rot to the pipes and a wash of Beil-Tan green to the lower half of the knife. Finally, a couple of thin coats of matte varnish were airbrushed on to the model to matte down and protect the miniature. In conclusion, I am very happy with how he has come out. The new process, combined with the use of more delicate washes (diluted with Lahmain Medium) has allowed me to quickly paint this model to a good standard. As is always the case, I try and take learning forward... onwards to Tree Folk and the Sons of Sanguinius! BathCon 2017 was the wargaming day I've planned since the beginning of this year. On the weekend of 2nd September, I hosted 3 friends for a full day of X-Wing, Shadow War: Armageddon and Warhammer 40,000... and then some Poker! Since I organised the event it has been the sole focus of my hobbying time. My goal was to get into a position where I could present a gaming table full of painted terrain and where possible fully painted models. Whilst achieving all the goals I set myself was impossible, I was able to prepare all the scenery pieces I wanted to paint. With one of the game on the roster being Shadow War: Armageddon this was no small feat! Prior to the event, I ran a roll to determine which game systems my guests would like to play. the 3 winners were X-Wing, Shadow War: Armageddon and Warhammer 40k. The two games which lost out were Age of Sigmar and Blood Bowl. This is the board set up prior to the event. Whilst I made posts on this blog covering some of the pieces of terrain used, I didn't post about them all. Over the coming weeks, I will probably catch up with such posts as I learnt a lot from my experiences and would like to share that information. To kick things off we played 2 games of X-Wing. It's been about 18 months since I last played and had forgotten how much fun it can be! I played a simple 50 point match whilst the other game involved a few more models on each side(as can be seen in the picture below). We chose to play a 4 player battle in SWA, so 1v1v1v1... which turned out to be a lot of fun! We played it on the full 6v4 table packed full of terrain. It took 3 hours.. which is a bit longer than most SWA battles are supposed to last but it was hugely entertaining. We had Orks v Chaos Marines v Space Marine Scouts v Sly Marbo! the Orks and Chaos Marines spent most of the battle trying to tickle each other to death in combat whilst Sly Marbo did some cheeky stabby-stabby moves with his poisoned knife. The less said about the Space Marine Scouts the better! Finally, we played some 40k. a 50 power level battle. Chaos v Space Marines/Blood Angels. Unfortunately, we ran out of time and only managed 1 turn each before having to call it a day.